THE JUPITER PIONEER spacecraft were designed to fit within the 3-meter (10-foot) diameter shroud of the Atlas-Centaur launch vehicle. To do so each spacecraft had to be stowed with its booms retracted? and with its antenna dish facing forward, i.e., upward on the launch pad. Its basic characteristics are extreme reliability, very light weight a communications system for extreme distances, and a nonsolar heat source for electrical power generation. 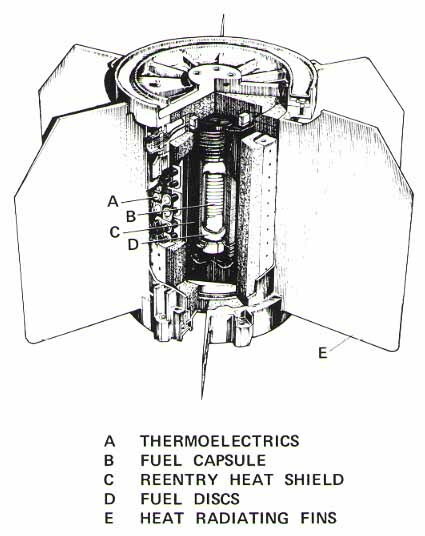 Figure 3-1 is a diagram of the Pioneer spacecraft. Each spacecraft comprises several distinct subsystems: a general structure, an attitude control and propulsion system, a communications system, thermal control system, electrical power system, navigation system, and, most important to the scientific mission, a payload of 11 sophisticated onboard instruments. Figure 3-1. A Pioneer spacecraft and its major subsystems. To communicate over long distances the spacecraft's dish-shaped antenna has to be pointed toward Earth. A simple and inexpensive way to do this is to spin stabilize the spacecraft and keep the spin axis pointed to Earth. So the spacecraft is stabilized by rotation (Figure 3-2). Each spacecraft is 2.9-meters (9-1/2 feet) long from its cone-shaped, medium-gain antenna to the adapter ring which fastened the spacecraft to stage three of the launch vehicle. Spacecraft structure centers around a 36-cm (14-inch) deep, flat, equipment compartment, the top and bottom of which are regular hexagons. Its sides are each 71-cm (28-inches) long. One joins to a smaller "squashed" hexagonal compartment that carries most of the scientific experiments. The 2.74-meter (9-foot) diameter, 46-cm (18-inch) deep, parabolic, dish-shaped, high-gain antenna of aluminum honeycomb sandwich material is attached to the front of the equipment compartment. 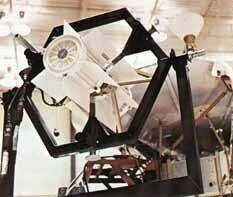 Its feed is topped with a medium-gain antenna on three struts which project about 1.2 meters (4 feet) forward. A low-gain, omni antenna extends about 0.76 meters (2-1/2 feet) behind the equipment compartment, mounted below the high-gain dish. Two three-rod trusses, 120 degrees apart, project from two sides of the equipment compartment. At their ends, nuclear electric power generators are held about 3 meters (10 feet) from the center of the spacecraft. A third boom, 120 degrees from the other two, projects from the experiment compartment and positions a magnetometer sensor about 6.6 meters (21-1/2 feet) from the center of the spacecraft. All three booms are extended after launch. Figure 3-2. Each Pioneer spacecraft is stabilized by rotation as shown under test here. ...Sun. Attitude position is calculated from the reference direction to the Earth and the Sun, with the known direction to Canopus provided as backup. Pioneer 11's star sensor gain and threshold settings were modified to improve performance based on experience with this sensor on Pioneer 10. Three pairs of rocket thrusters located near the rim of the antenna dish (Figure 3-3) are used to direct the spin axis of the spacecraft, to keep it spinning at the desired rate of 4.8 revolutions per minute, and to change the spacecraft's velocity. The system's six thruster nozzles can be fired steadily or pulsed by command. Each thruster develops its propulsive jet force from the decomposition of liquid hydrazine by a catalyst in a small rocket thrust chamber attached to the nozzle of the thrusters. Attitude and velocity changes are made by two thruster pairs mounted on opposite sides of the antenna dish rim. One thruster of each pair points forward, the other, aft. To change attitude, the spacecraft spin axis is rotated in the desired direction by firing two thrusters, one on each side of the antenna dish. One thruster is fired forward, one aft, in brief thrust pulses at a precise position in the circle of spacecraft rotation. Each thrust pulse, timed to the spacecraft's rotation, moves (precesses) the spin axis a few tenths of a degree, until the desired attitude is reached. To adjust spin rate, two more pairs of thrusters, also set along the rim of the antenna dish, are used. These thrusters are aligned tangentially to the antenna rim, one pointing against the direction of spin and the other with it. Thus to reduce spin rate, two thrusters fire against spin direction. Figure 3-3. Thrusters are used to control the spin of the spacecraft, its attitude, and its velocity. .....should there be a period of inactivity, automatically. Thus, should a receiver fail during the mission, the other can automatically take over. Two radio transmitters, coupled to two traveling-wave-tube power amplifiers, each produce 8 watts of power in S-band. The communication frequency uplink from Earth to the spacecraft is at 2110 MHz, the downlink to Earth at 2292 MHz. The turnaround ratio, downlink to uplink, is precisely controlled to be compatible with the Deep Space Network. The spacecraft data system turns science and engineering information into a specially coded stream of data bits for radio transmission to Earth. A convolutional encoder rearranges the data in a form that allows detection and correction of most errors by a ground computer at the receiving site of the Deep Space Network. There are 11 data formats divided into science and engineering data groups. Some science formats are optimized for interplanetary data, others for the Jovian encounter. Engineering data formats specialize in data handling, electrical, communications, orientation, and propulsion data. All formats are selected by ground command. Temperature on the spacecraft is controlled at between 23° C and 38° C ( 10° and 100° F) inside the scientific instrument compartment, and at various other levels elsewhere for satisfactory operation of the onboard equipment. The temperature control system coped with gradually decreasing heating as the spacecraft moved away from the Sun, and with two frigid periods one when Pioneer 10 passed through Earth's shadow at launch; the other at the time of passage through Jupiter's shadow during flyby. The system also controlled the effects of heat from the third-stage engine, atmosphere friction, spacecraft nuclear electric power generators, and other equipment. The equipment compartments are insulated by multi-layered blankets of aluminized plastic. Temperature-responsive louvers at the bottom of the equipment compartment, opened by bi-metallic springs, allow controlled escape of excess heat. Other equipment has individual thermal insulation and is warmed by electric heaters and 12 one-watt radioisotope heaters, fueled with plutonium-238. 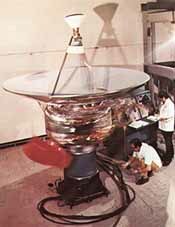 Nuclear-fueled electric power for Pioneer Jupiter comes from the four SNAP-l9 type Radioisotope Thermoelectric Generators (RTGs), developed by the Atomic Energy Commission (AEC), similar to those used to power the Nimbus-3 meteorological satellite. These units turn heat from plutonium-238 into electricity (Figure 3-4). Figure 3-4. Electrical power is developed in Pioneer by several radioisotope thermoelectric generators (RTG). Figure 3-5. Two RTGs are mounted at the end of each of two extended booms to reduce nuclear radiation effects on the sensitive scientific instruments. ....the RTGs over that needed by the spacecraft is radiated to space thermally through a shunt radiator, or charges a battery which automatically supplies additional power needed for short periods when the spacecraft demands more power than the output of the RTGs. The axis of the high-gain antenna dish is slightly offset from, but parallel to, the spin axis of the spacecraft within close tolerances throughout the mission. Except during initial stages of the flight near Earth and for periods when alignment must be changed to suit course correction, the spin axis of the spacecraft is always pointed toward Earth within a tolerance of one degree to provide best communication. Analysts use the shift in frequency of the Pioneer radio signal and angle tracking by the antennas of the Deep Space Net to calculate the speed, distance, and direction of the spacecraft from Earth. Motion of the spacecraft away from Earth causes the frequency of the spacecraft's radio signals to drop and their wavelength to increase. Known as a Doppler shift, this effect allows the speed of the spacecraft to be calculated from measurement of the frequency change in the signal received at Earth. The radio beam is offset one degree from the spin axis. As a result, when the spin axis is not directed exactly towards Earth, uplink signals received at the spacecraft from Earth vary in intensity synchronously with rotation of the spacecraft. 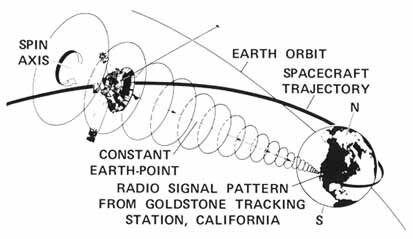 A system on the spacecraft, known as Conical Scan (CONSCAN) (Figure 3-6), was originally intended to be automatically used to change the spacecraft's attitude in a direction to reduce these variations in signal strength, thereby returning the spin axis to the precise Earth point to within the threshold of 0.3 degrees. However, flight operations personnel developed and used a direct command technique that results in conserving the spacecraft's gas supply. Investigation of interplanetary space on the way to and beyond Jupiter aimed to resolve a number of unknowns about the magnetic field in interplanetary space; cosmic rays, fast moving parts of atoms from both the Sun and the Galaxy; the solar wind, a flow of charged particles from the Sun, and its relationships with the interplanetary magnetic field and cosmic rays; and interplanetary dust concentrations, if any, in the asteroid belt. At Jupiter the spacecraft investigated the Jovian system in three main ways: measurement of particles, fields and radiation, spin-scan imaging to provide pictures of the planet and some of its satellites, and additionally, by accurate observation of the path of the spacecraft, measurement of the forces the gravity of Jupiter and the Galilean satellites-acting upon it. To achieve these scientific objectives, each Pioneer spacecraft carries the scientific experiments described in the next chapter. Figure 3-6. An automatic system in the spacecraft, known as CONSCAN, is used to help keep the spin axis of Pioneer pointing toward Earth. It relies upon a slight offset in the antenna feed axis to produce a wobbling signal at Earth when the antenna is not pointing exactly Earthwards. Controllers direct the spacecraft so that its antenna drifts past the optimum point and thereby they conserve thruster propellant. With more expenditure of propellant, CONSCAN could point the spacecraft's axis automatically.